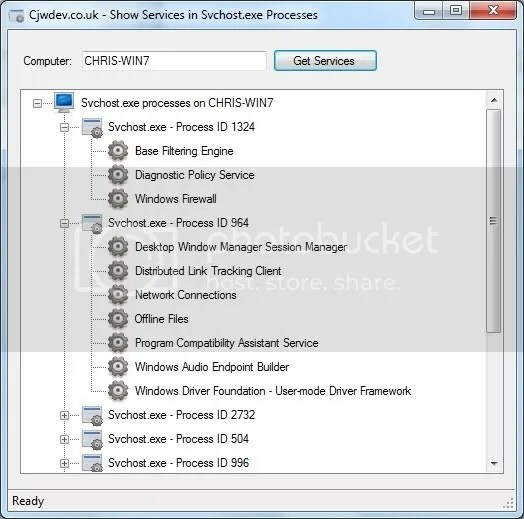 I posted some VB.NET code recently that demonstrated how to do this, but thought I would make a little application for those of you who are not developers and just want a quick simple way of finding out which services are running in which svchost.exe process. This application will run under a standard user account on all operating systems that I have tested it on (XP, Windows 7, Server 2003, Server 2008), you do not need to be an administrator. As you can see, you can easily run this against a remote computer as well (I know how lazy us IT people can be :)) , provided you have the relevant permissions on the remote machine of course. Let me know if you have any feedback – good or bad.